Looking for a hilarious party game that EVERYONE can play? Then whip out your Thingamajigâ„¢! It's a fresh, fast moving game where you gotta BLUFF a little, STRETCH the truth a tad, make it sound like it's probably THIS, but...maybe it's THAT! The Thingamajigâ„¢ comes with it's own Thingamabrain containing thousands of words so you can play with your Thingamajigâ„¢ over and over again! It's also portable so you can take your Thingamajig everywhere... makes an awesome travel game! For 3 or more adult players. 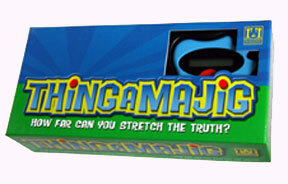 Thingamajig is a great party game from R&R Games. Designed by Aaron Weissblum, the game is the epitome of simplicty. The electronic gizmo displays a single word, noun, verb, adjective, etc., which the cluegiver must define for the other players. "Definitions" for the word have absolutely no restrictions. They can be as easy or hard as the cluegiver chooses. Other players write their guesses down for the word after hearing the definition. Each player who gets it right gets a chip. The cluegiver gets a chip for each player who gets it right UNLESS everyone gets it right. In that case, the cluegiver gets zero points. That's about it for rules. The game can be taught to new players literally in less that thirty seconds. The trick of the game is clear from the above description. Definitions have to be good enough to get some points, but not so easy that everyone guesses them. This challenge proves more and more tricky with each word that shows up on the gizmo's display. When the word "simple" came up on my turn as cluegiver, I said "uncomplicated". In this case, I hoped at least one player would guess the word to be "simple" and at least one would guess "easy". As it turned out, I got two points. Sometimes the best trick is to appeal to the knowlege of just one or two players, alluding to a past experience or something specialized like higher level mathematics. At one point I tried to get a friend to guess "typewriter" by referring to the high school typing class we shared years earlier. It didn't help him to guess the word, but the other two players guessed it instead! Beyond all these hilarious moments thoughout the game, what I love about Thingamajig is that it's open to the creativity of the individual players. The personality of the group is not limited to clues on cards. Shared knowlege between players and knowlege about other players become a large part of the decisions that will lead a player to victory. However, "brilliant" moments of correct guesses and successfully vague definitions are fun enough that winning hardly matters. Competitive players can strive for victory, but plenty of laughs and fun will be had by all. The first time we played my wife did quite badly, but she thoroughly enjoyed the game from start to end. Apparently there are some other uses for the Thingamajig gizmo listed at the R&R Games website. I haven't bothered to look there yet, as the basic game itself has me thoroughly entertained. I strongly recommend this game to anyone looking for something simple that will be enjoyed by gamers of many breeds.